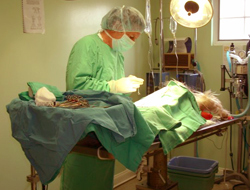 Surgical Procedures | Metuchen Veterinary Hospital, P.C. Whether conducting spay/neuter procedures, or more complex surgeries, at MVH we place special emphasis on patient safety and pain management. A pulse oximeter is utilized and a dedicated anesthesiology technician monitors the patient throughout surgery. Don’t let Fleas & Ticks bug your pets!